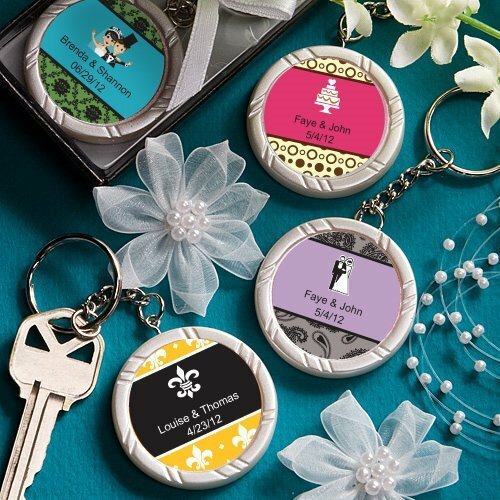 Let your creativity show with our Personalized Expressions key rings! The 1 1/2" round white poly resin charm features a grooved pattern border and smooth inset - perfect for adhering your custom label that is included at no additional charge. We offer an impressive variety of label colors and designs to make this favor truly one of a kind! The key chain is 5" long overall and is packaged in a display gift box with black base, silver insert and white satin bow. Minimal assembly is required to attach the labels to each charm. Do Personalized Wedding Key Ring Favors come in boxes? 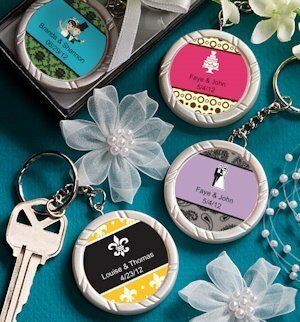 These Personalized Wedding Key Ring Favors are bulk packed. The key chain is 5" long overall and is packaged in a display gift box with black base, silver insert and white satin bow.